Disclaimer: Kansas City Orthopaedic Institute determines its standard charges for patient items and services through the use of a chargemaster system, which is a list of charges for the components of patient care that go into every patient’s bill. These are the baseline rates for items and services provided at the Hospital. The chargemaster is similar in concept to the manufacturer’s suggested retail price (“MSRP”) on a particular product or good. The charges listed provide only a general starting point in determining the potential costs of an individual patient’s care at the Hospital. This list does not reflect the actual out-of-pocket costs that may be paid by a patient for any particular service, it is not binding, and the actual charges for items and services may vary. Individuals with questions about their out-of-pocket costs of service and other financial information should contact the hospital or consider contacting their insurers for further information. The following charges reflect our most common x-ray and radiological procedures. For all exams requiring contrast, the contrast will be charged separately. Magnetic resonance imaging is done on a joint of the upper or lower arm. Magnetic resonance is a noninvasive, non-radiating imaging technique that uses the magnetic properties of hydrogen atoms in the body. The patient is placed on a motorized table within a large MRI tunnel scanner that contains the magnet. The powerful magnetic field forces the hydrogen atoms to line up. Radiowaves are then transmitted within the strong magnetic field. Protons in the nuclei of different types of tissues emit a specific radiofrequency signal that bounces back to the computer, which processes the signals and converts the data into tomographic, 3D images with very high resolution. The patient is placed on a motorized table within a large MRI tunnel scanner that contains the magnet. Small coils that help transmit and receive the radiowaves may be placed around the joint. MRI scans on joints of the upper extremity are often done for injury, trauma, unexplained pain, redness, or swelling, and freezing of a joint with loss of motion. MRI scans provide clear images of areas that may be difficult to see on CT. Magnetic resonance imaging is done on a joint of the upper or lower leg. Magnetic resonance is a noninvasive, non-radiating imaging technique that uses the magnetic properties of hydrogen atoms in the body. The patient is placed on a motorized table within a large MRI tunnel scanner that contains the magnet. The powerful magnetic field forces the hydrogen atoms to line up. Radiowaves are then transmitted within the strong magnetic field. Protons in the nuclei of different types of tissues emit a specific radiofrequency signal that bounces back to the computer, which processes the signals and converts the data into tomographic, 3D images with very high resolution. The patient is placed on a motorized table within a large MRI tunnel scanner that contains the magnet. Small coils that help transmit and receive the radiowaves may be placed around the joint. MRI scans on joints of the lower extremity are often done for injury, trauma, unexplained pain, redness, or swelling, and freezing of a joint with loss of motion. MRI scans provide clear images of areas that may be difficult to see on CT. The physician reviews the images to look for information that may correlate to the patient's signs or symptoms. MRI provides reliable information on the presence and extent of tumors, masses, or lesions within the joint; infection, inflammation, and swelling of soft tissue; muscle atrophy and other anomalous muscular development; and joint effusion and vascular necrosis. Magnetic resonance imaging (MRI) is done on the cervical, thoracic, or lumbar spinal canal and contents. MRI is a noninvasive, non-radiating imaging technique that uses the magnetic properties of nuclei within hydrogen atoms of the body. The powerful magnetic field forces the hydrogen atoms to line up. Radiowaves are then transmitted within the strong magnetic field. Protons in the nuclei of different types of tissues emit a specific radiofrequency signal that bounces back to the computer, which records the images. The computer processes the signals and coverts the data into tomographic, 3D, sectional images in slices with very high resolution. The patient is placed on a motorized table within a large MRI tunnel scanner that contains the magnet. MRI scans of the spine are often done when conservative treatment of back/neck pain is unsuccessful and more aggressive treatments are considered or following surgery. Images are taken first without contrast and again after the administration of contrast to see the spinal area better. The physician reviews the images to look for specific information that may correlate to the patient's symptoms, such as abnormal spinal alignment; disease or injury of vertebral bodies; intervertebral disc herniation, degeneration, or dehydration; the size of the spinal canal to accommodate the cord and nerve roots; pinched or inflamed nerves; or any changes since surgery. Magnetic resonance imaging (MRI) is done on the cervical spinal canal and contents. MRI is a noninvasive, non-radiating imaging technique that uses the magnetic properties of nuclei within hydrogen atoms of the body. The powerful magnetic field forces the hydrogen atoms to line up. Radiowaves are then transmitted within the strong magnetic field. Protons in the nuclei of different types of tissues emit a specific radiofrequency signal that bounces back to the computer, which records the images. The computer processes the signals and converts the data into tomographic, 3D, sectional images in slices with very high resolution. The patient is placed on a motorized table within a large MRI tunnel scanner that contains the magnet. MRI scans of the spine are often done when conservative treatment of back/neck pain is unsuccessful and more aggressive treatments are considered or following surgery. 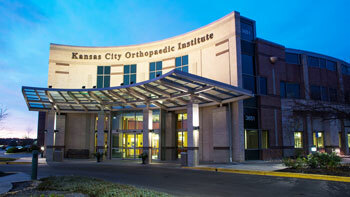 Thank you for choosing Kansas City Orthopaedic Institute for your healthcare needs. At Kansas City Orthopaedic Institute, we are committed to making the billing process as patient-friendly as possible. Here are some ways you can help the billing process go smoothly. Our goal is for each of our patients and their families to have the best healthcare experience possible. Part of our commitment is to provide you with information that helps you make well informed decisions about your own care. If you need more information about the price of a future service, please contact our Patient Access Dept. at 913-253-8951. A CPT code is strongly encouraged when you call. You can obtain the CPT code from the ordering physician. To ask questions or get more information about a bill for services you've received, please contact our Billing Dept. at 913-253-8932. © 2018 Hospital Pricing Specialists LLC - ALL RIGHTS RESERVED.